SCVHistory.com LW3454 | Ridge Route | U.S. Highway 99 at Piru Gorge, ~1950s. Side-by-side comparison in 2018 by Dave Terrill. Click to enlarge. 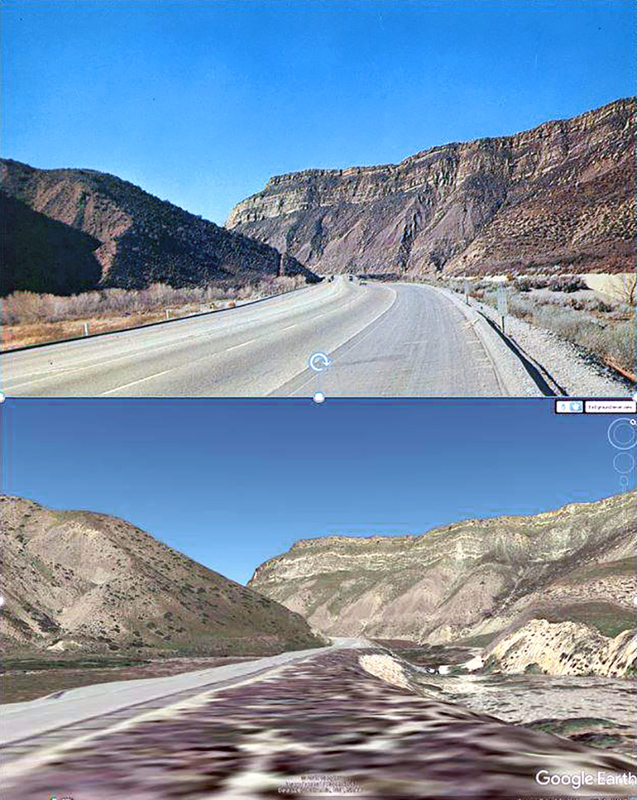 Traveling north on U.S.-99 (aka Golden State Highway / The Ridge Route) north of Castaic at Piru Gorge, which is visible at right, ~1950s. 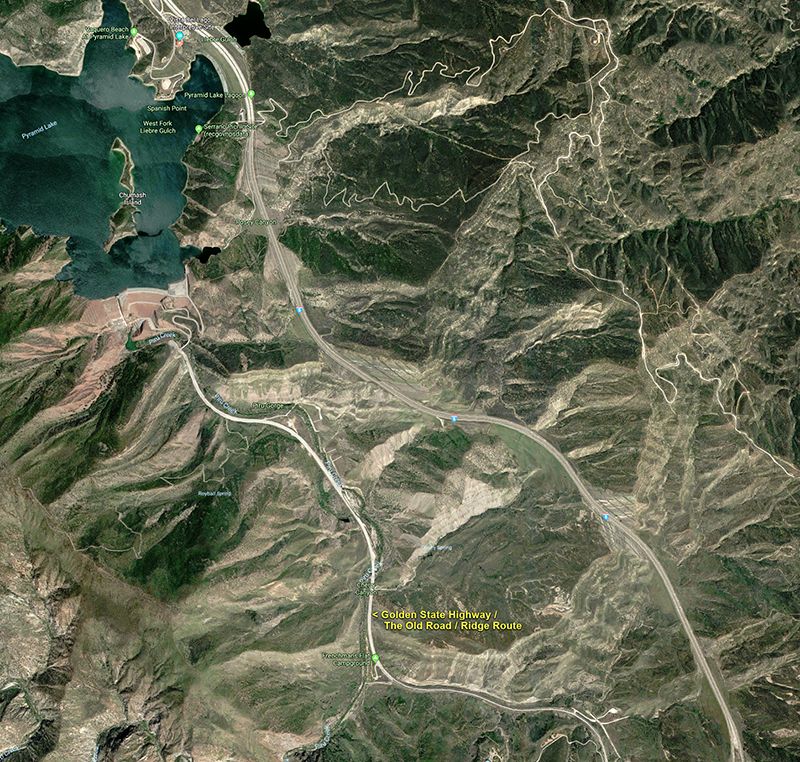 The location is south of the current Pyramid Lake (which did not exist at the time), between the Frenchman's Flat campground and the Pyramid dam. See map below. Highway 99 winds its way from Los Angeles to Bakersfield where it is known as the Ridge Route. The present road follows in part the course used by the early stagecoaches. The first corkscrew road was completed in 1919 and was considered the first word in road building at the time of its construction. The summit of Tejon Pass has an elevation of 4,182 feet ... M.P. Merle Porter was known as "the postcard king of the west." He produced and distributed his "photo-color" postcards under the name Royal Pictures of Colton, California. 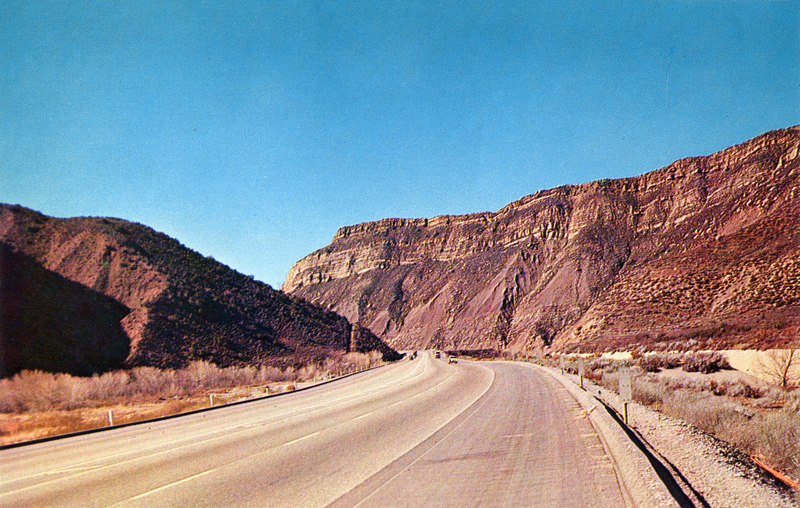 Porter traveled nine months out of the year for over fifty years — putting as many as one thousand miles a week on his Ford Econoline van — photographing the historic sites, monuments, architecture, highways, infrastructure, oil fields, and landscapes of the western United States in color using his Speed Graphic view camera. While traveling he distributed his postcards to motels, souvenir shops, and gas stations, circulating one million postcards per year at the height of his career. 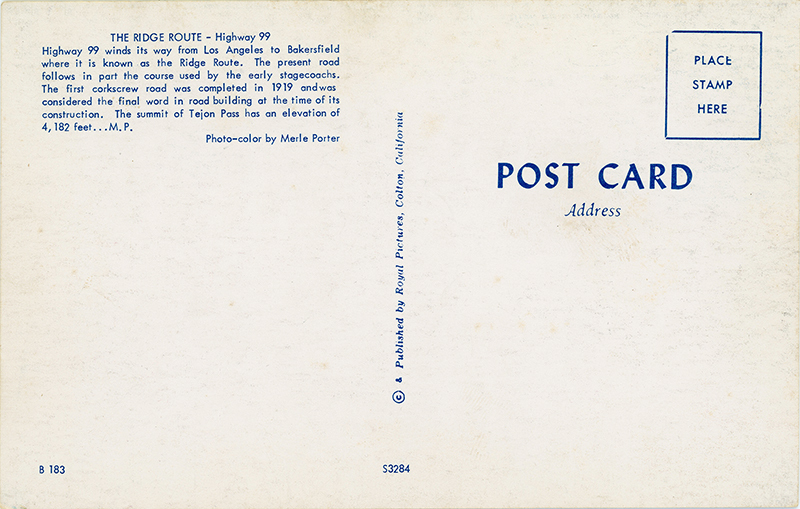 Porter wrote lengthy and descriptive captions full of historical facts and local lore to be printed on the back of each postcard. "Territory in Photo-Color: The Post Cards of Merle Porter" was the subject of an exhibition at the Center for Land Use Interpretation in Los Angeles in 1999. Twenty thousand postcards were for sale in the exhibition, with hundreds of unique postcards displayed on the wall using postcard racks; early films shot by Porter were also screened. Though Porter's family stopped circulating his postcards after his death in 1989, they can still be purchased at the Center for Land Use Interpretation in Los Angeles. Google maps, 2018. Click image to enlarge. LW3454: 9600 dpi jpeg from original postcard purchased 2018 by Leon Worden.